The Arctic National Wildlife Refuge in Alaska. Oil companies will have a chance to explore an untapped and virtually unexplored frontier if Congress passes pending legislation that includes oil leasing in the Arctic National Wildlife Refuge. The geology of the coastal plain of ANWR is very promising, or “highly prospective,” in the lingo of the oil industry. The area would be expensive for exploration, but it is thought to hold greater potential for big new discoveries than any other U.S. onshore area. Companies typically do not like to publicly signal their interests in advance of clinching a project. It would amount to alerting competitors. Behind the scenes, they keep looking at the Alaska North Slope, including ANWR, and several continue to discover and develop North Slope fields. “We get inquiries, I don’t want to say every day, but every week,” Andrew Mack, commissioner of the Alaska Department of Natural Resources, told Bloomberg Environment. The inquiries are about leases on state land adjacent to ANWR, in state waters just off the coast of the refuge, and other areas on the North Slope, he said. “So is there interest? Yeah, there is,” Mack said, when asked about oil company interest in ANWR. David Houseknecht, a U.S. Geological Survey senior research geologist known for his expertise on North Slope oil and gas, said he gets inquiries about ANWR from companies around the world. Potential bidders for ANWR leases can be seen among the larger companies working on the North Slope, including Exxon Mobil Corp., BP Plc, ConocoPhillips Co., Chevron Corp., Anadarko Petroleum Corp., Spanish giant Repsol S.A., and Italian giant Eni S.p.A. Typically they will not go beyond generic statements about supporting more access to federal lands, including the coastal plain of ANWR. Exxon Mobil is working on state lands on the edge of ANWR, where in 2016 the company started up production from the Point Thomson field, with BP as minority partner. BP and Chevron in 1994 discovered the Sourdough field on the edge of ANWR but never developed it, an indication of poor economics. More companies occasionally show up. The latest is Australian company Oil Search Ltd., which announced near the end of October that it would invest $400 million to buy a stake in the Nanushuk oil field, which was discovered in 2015 on North Slope on state land west of Prudhoe Bay. The Tax Cuts and Jobs Act (H.R. 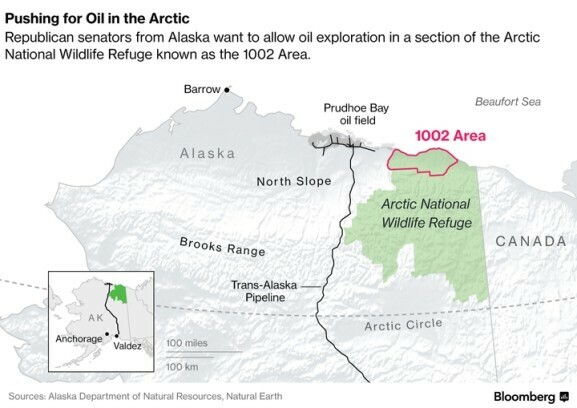 1) lined up by Republicans in Congress includes a mandate to lease the 1002 area of ANWR for oil exploration. That area, 1.5 million acres on the coastal plain, was designated for possible oil exploration by Section 1002 of the Alaska National Interest Lands Conservation Act of 1980. A House-Senate conference still must work out a final version of H.R. 1 through the budget reconciliation process, but that is not expected to focus on ANWR. Sen. Maria Cantwell (D-Wash.) tried twice to get the Senate to block inclusion of those provisions in the bill, but both efforts failed on 52-48 votes. The legislative action doesn’t mean exploratory drilling in ANWR is assured. The legislation, as written by Sen. Lisa Murkowski (R-Alaska), requires a first lease sale within four years of enactment of the Tax Cuts and Jobs Act. An oil field development—if a field is found—is expected to take 10 years to get from the start of exploration to first production. Ten years is enough time for changes in party majorities in Congress and election of a different president. New majorities and a new president could lead to legislation halting ANWR work before it ever gets to production—possibly before it gets to exploratory drilling. Companies jealously guard proprietary information about ANWR from an extensive 1980s seismic survey and an exploratory well drilled in 1986. The U.S. Geological Survey was given access to the data and in 1998 estimated that the recoverable oil in the 1002 area of ANWR could range from 4.25 billion to 11.8 billion barrels based on technologies at that time. But “technically recoverable” does not mean economically recoverable, and the expectation is that the high cost of North Slope operation would limit production to less—maybe much less—than the technical amount. The average cost of North Slope oil production is around $40 to $45 a barrel, said Kara Moriarty, president and CEO of the Alaska Oil and Gas Association. She added that companies bid for leases and invest based on what they think the long-term prices of oil will be, not the current price. “The oil companies do not make drilling decisions based on today’s price of oil, obviously,” said Houseknecht, the USGS geologist. North Slope capital investment and operating costs together probably have break-even prices in the $40s to $50s per barrel, Jerry Burnett, deputy commissioner of the Alaska Department of Revenue, said. 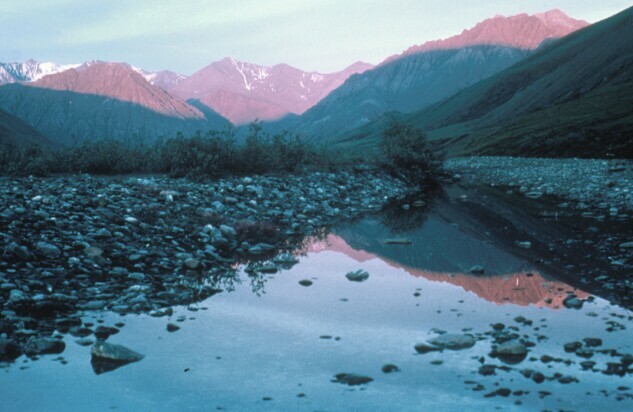 The Kongakut Valley in the Arctic National Wildlife Refuge in Alaska. Burnett’s department is forecasting a very gradual decline in Alaska oil production, from 533,000 barrels a day in fiscal year 2018 to 493,000 barrels a day in 2027, assuming prices stabilize around $60 a barrel for Alaska North Slope and then grow with inflation. The forecast includes nothing from ANWR. The U.S. Geological Survey doesn’t expect super giant oil fields like Prudhoe Bay will be found in ANWR, but there is thought to be a good chance of finding large fields—holding hundreds of millions of barrels each. Such fields could be on a scale similar to discoveries announced in recent years elsewhere on the North Slope, Houseknecht said. Houseknecht cited the examples of the Alpine, Nanushuk, Willow, and Smith Bay discoveries as examples of the kinds of fields that might be found in ANWR—large enough to develop economically even at today’s prices. Alpine, discovered in 1994, was expanded in 2015 when ConocoPhillips drilled the first commercial production well in the National Petroleum Reserve-Alaska (NPR-A). The field—or more broadly the Colville River Unit including it—has produced more than 520 million barrels and is going strong. Armstrong Oil & Gas Inc., with partner Repsol, discovered the Nanushuk field in 2015 and has since estimated the field’s recoverable reserves at 1.2 billion barrels. ConocoPhillips discovered the Willow field farther into NPR-A in 2016 and estimated its recoverable reserves at 300 million barrels. Caelus Energy LLC discovered a potentially enormous field in Smith Bay, in state waters off the coast of NPR-A, in 2016. The privately held company said the field may have 6 billion to 10 billion barrels of oil in place, of which 30 percent to 40 percent may be recoverable. Prudhoe Bay, one of the two largest fields ever discovered in the Western Hemisphere, has produced more than 13 billion barrels and keeps pumping more. The coastal plain of ANWR unquestionably has oil. The oil seeps to the surface here and there, coagulating into tar in ponds of water. It stains sedimentary rocks exposed on the surface. In 1984-85, a consortium of companies financed a seismic survey covering 1,451 linear miles on the ANWR coastal plain. The data remains confidential, held by 11 companies remaining from the consortium. “Some of the companies are actively reinterpreting and reprocessing some of that seismic data on their own,” Houseknecht said. The Arctic Slope Regional Corp., a native corporation with a range of surface and subsurface rights on the North Slope, has been preparing to facilitate a new seismic survey in ANWR as expeditiously as possible, Houseknecht said. ASRC is one of the companies with rights to the older seismic data. Chevron, teamed with BP, drilled an exploratory well in ANWR in 1986. The results of that well, like the 1984-85 seismic data, are confidential. One well, whatever it may reveal, is only a start. “There are lots of surprises lurking in the subsurface,” Houseknecht said. The pending Tax Cuts and Jobs Act would allow no more than 2,000 surface acres of ANWR to be disturbed for production and support facilities. That should not be a problem, in the view of Mack at the Alaska Department of Natural Resources. Exxon Mobil, in its $4 billion development of the Point Thomson field just outside ANWR, confined surface disturbance to less than 250 acres, including two drilling pads, an airstrip and other facilities, Mack said. Exxon Mobil also built a pipeline in 2014 westward 22 miles to the Badami field, where another pipeline transports oil the rest of the distance to the start of the Trans-Alaska Pipeline at Prudhoe Bay. An oil discovery in ANWR will have a ready-made right of way for oil to move west. “It definitely would be in the same right of way,” Mack said. It most likely would move in the same pipeline, at least at first, although a new larger pipeline might have to be built at some point, Mack said. Drilling and movement of equipment would occur in ANWR, as at other North Slope fields, in winter on ice roads and ice pads to minimize damage to the tundra. Mack said the companies are in the habit of doing that and have become highly proficient at lining up their trucks in preparation for the opening of ice roads during each January-March drilling and trucking season.